On Sunday 22nd September 2013 we were saddened to learn that Bill McBrinn had died, aged 83. Bill had been a member of the Scottish Veteran Harriers Club for longer than I can remember, served on the Committee for many years including 1 year as President (88-89), and was given Honorary Life Membership in 2006. He will be fondly remembered for his McBrinnlets, which were a Newsletter feature from 1989 (or earlier?) until 2008. and his promotion of the annual Snowball® race (originally the Alastair McInnes Memorial Race), where he provided Snowballs® to every competitor, and to all the helpers. He also provided countless prizes at his own expense. He would also often hand out diaries, and more Snowballs®, after the annual 10,000m track race. Bill was born in Coatbridge, where he lived for the whole of his life. There he met Margaret, who became his wife for 51 years. The other loves of his life were athletics and magic, as well as a bit of acting. He was an Equity card holder, and appeared in many Scottish TV dramas such as Taggart and Edge of Darkness, under his stage name Billy Stevens. He was also a member of the Magic Circle, and in 1975 was President of the Scottish Association of Magical Societies. He would often perform tricks at SVHC social and athletics events, and was still performing 2 weeks before he died. Bill was a regular competitor in veterans events, and represented Scotland regularly in the British & Irish Cross Country International. He competed at every distance from 800m up to marathon. In the latter he set a British M55 record of 2:34:24 at Greenock on 25/08/85, and a British M60 record of 2:46:36 on 21/04/91 at Fort William. Both these records still stand. The M60 record is exceptional because Bill had suffered a heart attack 3 years earlier. Bill suffered another heart attack in the BVAF Indoor Track Championships at the Kelvin Hall. He won the 800m, and had qualified for the 1500m final, when he suffered chest pains and had to be taken to the Western Infirmary. He had to be dissuaded from returning for the final, which he reckoned he would have won when he saw the winning time! He kept on racing into his late 70s and ran 22:50 in the SVHC 5km in 2007, but although the loss of half a lung to cancer curtailed his running somewhat, it didn’t stop him completely and he continued training until just 3 months before his death. In 2010 my wife and I, along with many other SVHC members, were privileged to be invited to his 80th birthday celebrations at St Patrick’s Church Hall in Coatbridge. Bill was in fine form and it was a great night. Bill is survived by his six children James, John, Steven, David, Mary and Diane, and eight grandchildren. It is worth adding that the irrepressible, jovial Bill also ran very well in the Scottish Veterans Cross Country Championships, winning M50 silver medals four times plus one bronze. Once he turned 55 he won the title in 1986 and followed that with two more silver medals. 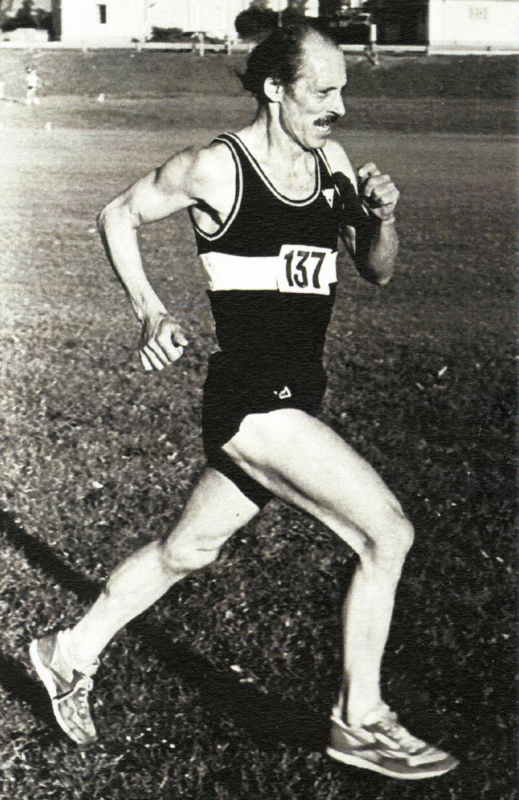 Remember he was competing in his age-group against World Champions: Alastair Wood, Bill Stoddart and Willie Marshall. Bill must have been delighted when his daughter-in-law Elaine McBrinn won the W35 Scottish Championship in 1989.